Feel free to use any information you find on this page. We only ask you link back to us as the source in your article. In our 20+ years working with SAP customers as advisors and in a research capacity, we hold one principle at the core of our values around SAP success. SAP customers who build a mature SAP Centre of Excellence achieve much greater SAP success than those who don’t. 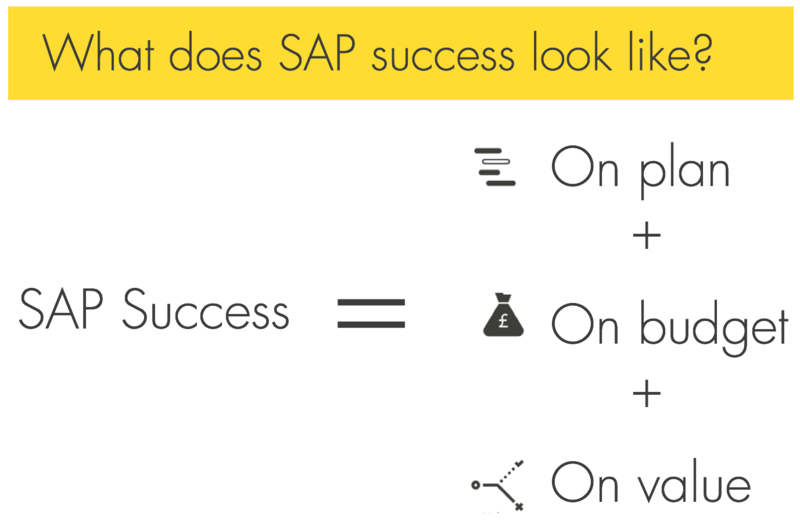 But what do we mean by SAP success? Dr Derek Prior - former Gartner Research Director and non-executive Director at Resulting spent his 19 year Gartner career speaking to thousands of SAP customers. Derek distills SAP success down to this simple formula. Feel that their SAP programme kept to the original delivery plan. Why aren't you getting results from your SAP investment...? 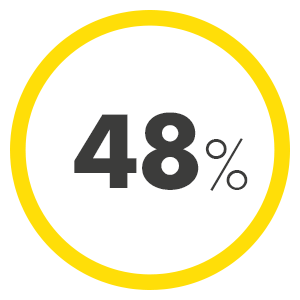 In our SAP Success Report we revealed that fewer than 50% of SAP customers realise their business objectives from SAP projects. 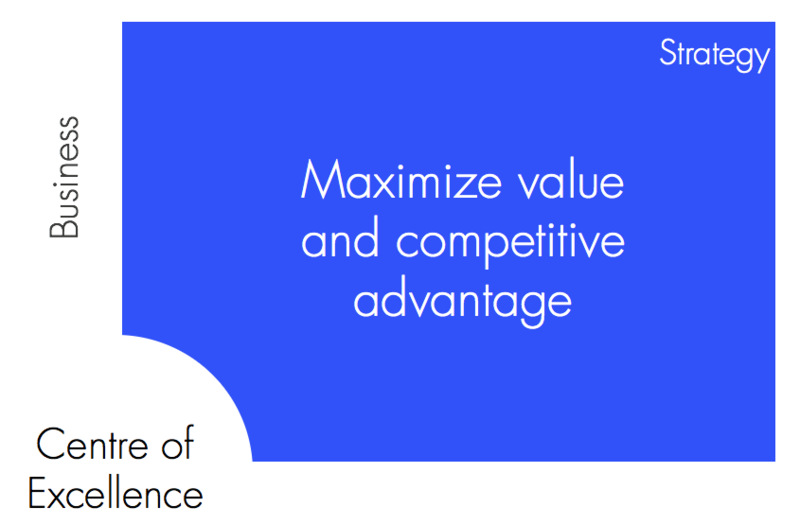 Further analysis through our SAP Success Optimizer benchmarking engagements reveals that SAP customers with the lowest scores lack the core capabilities required to deliver business value. This invariably means they haven't invested in building a mature SAP Centre of Excellence. 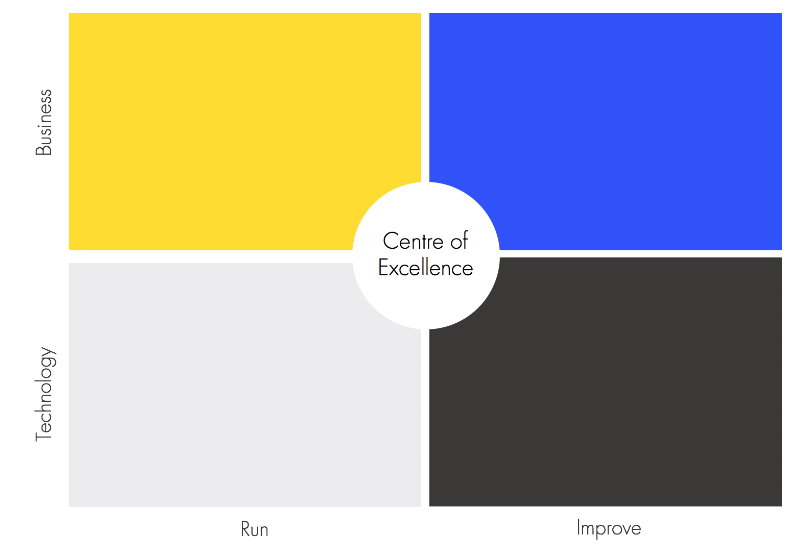 What do we mean by SAP Centre of Excellence ? The team at Resulting have designed, built and optimised more SAP Centres of Excellence than any other independent consulting firm. Our approach to SAP Centres of Excellence differs from others. We know this because we’ve successfully secured engagements bidding against Accenture, Capgemini, IBM and even SAP themselves. And we've built SAP Centres of Excellence for some of the worlds biggest companies. 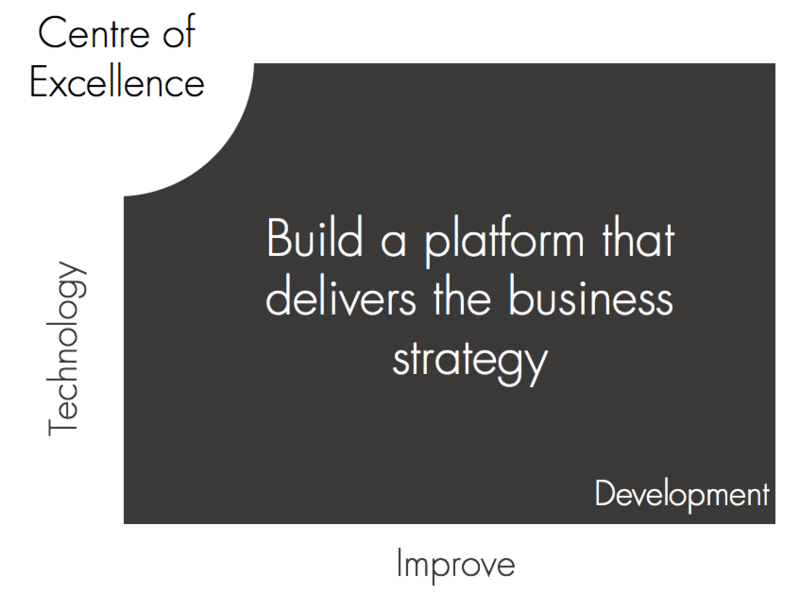 But, before we outline what a SAP Centre of Excellence is, let’s be clear about what a SAP Centres of Excellence isn’t. Because busting this myth is critical to SAP Success. If you think that it is, you should save yourself time now. Stop reading and go and do something else. And, accept that SAP success isn’t coming your way. If you can hold that thought, you should read on. And massively increase your chances of SAP success. Imagine for a moment that there are only 4 things in the universe. Now, imagine that these 4 things can be described using a 2x2 matrix. This is the universe that your SAP Centre of Excellence occupies. The trouble is, most companies think about their SAP Centre of Excellence as an IT Support function - they’re in the bottom left Run IT quadrant. They’re concerned with Service Desks, Tickets, Level 1, 2 and 3, SLAs, technical monitoring, password resets, backups and batch failures. But you didn’t invest £millions in SAP to do boring things like manage tickets. You invested £millions in SAP to achieve something in the top-right corner of the universe. Being “On Value” with your SAP investment means improving your business. Delivering on that business case. Making stuff better for your staff, customers and shareholders. This is why your SAP Centre of Excellence needs to occupy all 4 quadrants of the SAP Success Universe. Working with SAP customers to make them more successful over the past 2 decades, we’ve refined and improved our SAP Centre of Excellence best practice model to define 27 individual capabilities that fill the SAP Success Universe. Rather than make our approach a secret, we’ve decided to Open Source our SAP Centre of Excellence model and make it available so that any SAP customer can become more successful. Your Service Desk provides a point of contact for SAP users to access the SAP support service and other IT Services. Although users may contact the Service Desk via Super Users, the Service Desk is responsible for formally logging and monitoring incidents raised by users. Modern Service Desks should be more about self-service and less about ticket logging. Do you ever call a service desk to get your iPhone fixed? The Service Management function ensures that all agreed service processes are in place, followed and governed to ensure that the SAP Centre of Excellence can meet agreed Service Levels. The exact construct of Service Management will depend on your sourcing arrangements - for example, an outsourced team with multiple vendors providing different components will most likely require some in-house Service Management function in addition to vendor Service Management. Many organisations have adopted ITIL practices for Services Management. While ITIL sometimes provides useful definitions, as a set of best practices ITIL is also a little rigid and outdated for modern applications management needs. Certain ITIL processes need to be adapted to cater for the nuances of a packaged application like SAP - for example Configuration Management. The notion of Super Users also challenges ITIL’s sacrosanct views that all incidents must be logged with the service desk. It is useful to make a distinction between technical monitoring (e.g. disk space, memory usage) and application monitoring. Application monitoring deals with business relevant processes including interfaces, batch jobs, data loads and workflows. In addition to monitoring, this capability must also address the ability to perform controlled stop/start of end-to-end processes - and understand the practicalities of re-processing failed transactions. Application monitoring may be automated or carried out as an offshore service ensuring low cost and 'early operational day' support by taking advantage of time zone differences. This capability is one of the most critical yet most under-played in most SAP Centres of Excellence. Often, these services are spread across multiple functions and multiple vendors - meaning that high severity incidents and outages often have a severe impact on the business as resolution can be slow and disjointed. When new developments are released to the business (on any scale) it is important that the production acceptance process is managed formally. This ensures that releases are acceptable to the business and that the various support functions have the necessary tools, skills and knowledge to provide an appropriate level of service to the business. The service handover transition process (sometimes called Operational Acceptance or Service Gateway) will be involved early on in the change and release management processes and will be tasked with facilitating handover to both the business (stability of release) and service (supportability of the release) based on pre-agreed checklists and plans. The attitude of this capability is potentially more important than the processes it follows. A level of practicality and realism has to be applied to achieve the correct balance of ensuring that releases have been diligently prepared for hand-over, and accepting that sometimes compromises have to be made to get a large release “into the wild” . The Functional team within your Centre of Excellence provide 2nd and 3rd line SAP application support following initial prognosis by 1st line support. There are no hard-and-fast definitions of Level 2 and Level 3, but a useful distinction is that Level 2 provides incident resolution and problem management to identify root causes. Level 3 perform application configuration and development under change control. The scope of applications is dependent on the scale of the SAP implementation and includes (but is not restricted to) core SAP functionality, Business Warehouse, Portal, certain industry specific solutions and extensions. This is likely to be your largest team due to the broad mix of skills involved - and the fact that SAP functional skills are not really ‘compressible’ - that's to say, it’s unlikely that a single person will be able to cover a wide range of modules. This requires the provision of an operable and recoverable hardware infrastructure and the ongoing management of hardware availability and capacity. In modern times, it is likely that at least the pre-production landscape will be hosting in a private cloud. However, it is becoming commonplace for production landscapes to be provisioned in the same way. 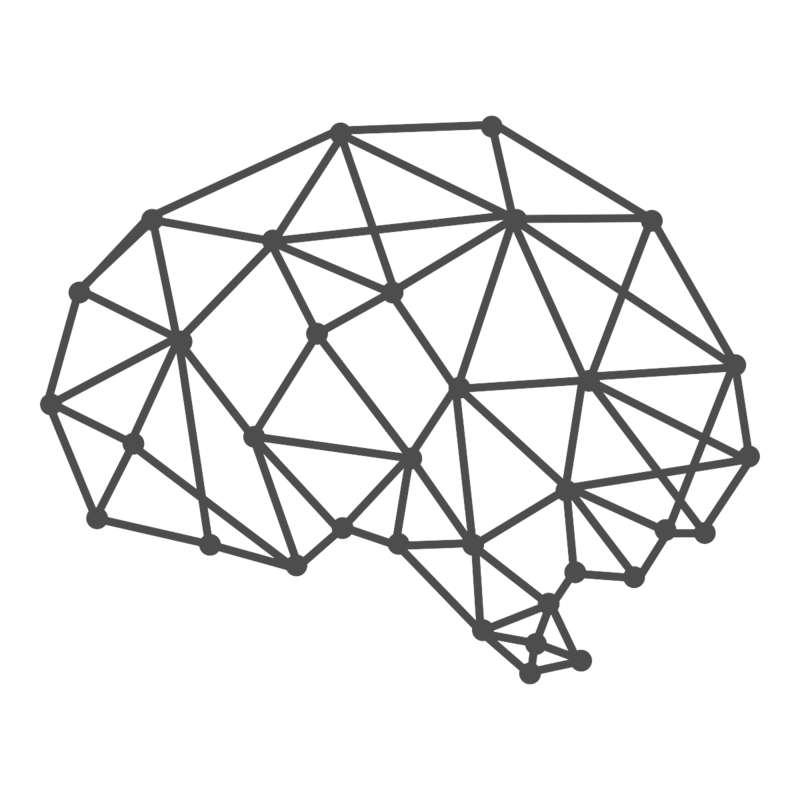 Although hosting of the platform is becoming a commodity service, care still needs to be taken to ensure that an appropriate technical architecture is in place to balance performance with cost of operation. This mean the management and maintenance of the application components required for the application to run as expected. This includes management of the SAP Basis layer - including daily checks, monitoring and performance tuning. The Basis component of SAP encapsulates the operations element of support including monitoring and systems administration. But it also includes user setup, print management, performance tuning and the application of patches. We find it useful to avoid the term Basis when scoping Centre of Excellence services - instead breaking the scope of services down into discrete functions. This ensures that other technical monitoring tasks that are not within the SAP defined Basis scope (e.g. middleware availability and performance) are accounted for. Much of the monitoring aspect of this service should be automated or managed using a monitoring tool such as Solution Manager or one of the many Enterprise monitoring platforms (e.g. BMC Patrol). There is a need to provide an aggregation point between resolver groups within the service organisation and support contracts provided by software and hardware vendors to integrate vendors into the service model. This includes access to SAP services such as OSS and Max Attention but will also include other 3rd party vendors which may be consumed across both application management services and project delivery. Other aspects of vendor support include licence management, access to expertise and supporting the development of roadmaps and upgrade plans. With SAP in particular, many organisations fail to make the vendor work for their maintenance fee. There are many services available which we would advise SAP customers to take advantage of (e.g. Data Volume Management). When defining a set of capabilities within a SAP Centre of Excellence, some people find it strange that we call-out users as a specific capability. Surely, users are simply customers of the Centre of Excellence? There are a number of reasons why we focus on users specifically. First, it’s because we find the term 'users' provocative and borderline offensive. They’re not ‘users’, they’re people. Users is a term that IT functions created to describe the people who ‘use’ the applications and technology that IT is responsible for. But these people don’t self-identify as ‘users’. Which brings us on to our second reason for focusing on them - they’re all different. They have different roles, needs, levels of experience and even different employers (if you assume that 3rd parties also have touch points with your SAP solution). Users may include the CFO, the AP clerks, the Sales Director, the HR Business Partner, and your IT team (ironically). But they may also include customers, Logistics Service Providers, vendors, outsourced business process staff, contractors and even potential candidates in your recruitment funnel. Good SAP Centres of Excellence place an importance on the different types of ‘user’ (and ensure they’re considered separately - addressing time zone, language, access channel and practical differences. These are people identified as key points of contact between members of the SAP user community and the SAP CoE. They provide advice and guidance on business process and system usage. Many organisations stand-up a Super User group for major go-lives and then disband the group when things get ‘back to normal’. But great Centres of Excellence manage the Super User network as an ongoing community, providing them with quality, up to date information and knowledge. They run forums and clinics, even annual Super User symposiums to ensure that these people can drive adoption of the SAP solution on a day-to-day basis working alongside their peers. A key question to ask when considering your Super User strategy and selection process - are they really super? Could they proudly wear a spandex suit and a cape? Do they have super powers in your organisation to make a difference to adoption? If they don’t, then you don’t have Super Users. You have slightly above average users. A good SAP Centre of Excellence will need to deliver a series of processes that span IT and business functions in order to manage user access. This capability includes the provision of initial user access, creation/modification of roles and allocation of roles to users. It must also deal with joiners, leavers and movers, ensuring that the correct roles are activated and deactivated. There is also a link with Vendor Support from a Licence Management perspective. Finally, there is a security governance and audit obligation to ensure compliance with Risks and Controls including Segregation of Duties and other legislative standards. Good SAP Centres of Excellence take a proactive approach to Governance and adopt self-service principles for password resets and user joiner/leaver requests. As our SAP Success Report highlights, a focus on adoption is one of the most influential factors in SAP success. But many organisations view SAP training as a programme activity with a training work stream delivered as a late phase of delivery. 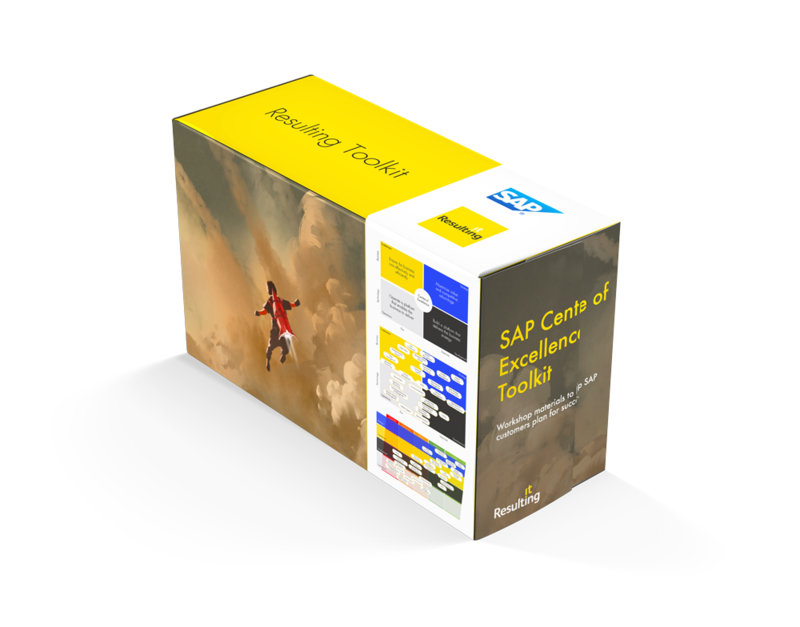 Successful SAP customers embed ongoing training and education into their Centres of Excellence. This capability is responsible for the development, organisation and ongoing delivery of training and education to SAP users and Super Users. They maintain up to date training materials and SAP system help in addition to Frequently Asked Questions. Allied to this, an ongoing communications plan linked to the needs of specific user communities should be built into the SAP Centre of Excellence. This can involve email campaigns, newsletters, FAQ and DYK documents, videos, Q&As and webinars. Treat your most important people ('users') as as a community and engage them. It’s a well known fact that poor Master Data is a recurring theme with problematic SAP solutions. Which is why SAP programmes place a high emphasis on data cleansing. But most SAP customers forget that clean data gets dirty very quickly if you don’t place a similarly high emphasis on data quality after go-live. Your data management organisation may be centralised or distributed and is responsible for the definition of data objects and managing the lifecycle of business master data based on formal standards and procedures. The scope may also include technical data (e.g. interface mappings) that may be managed by an IT function. In addition, the function may take responsibility for the quality of data and ensuring that it is managed consistently across systems. A key question to ask - are you as obsessive about data quality once your SAP system is live as you were when preparing to cut-over during your data migration? If not, why not? Business Process Support may be a central of virtual function providing a range of services that ensure the business has an active involvement in the support and ongoing management of the SAP system. The remit may include provision of 1st line business process advice, maintenance of key business documentation, involvement in identification, prioritisation and approval of system changes, participation in user testing, local training and re-processing of failed transactions. But the key function of the Business Process Support capability is to provide solutions that relate to business issues where the query relates to a process or policy that is outside of the remit of the IT team. Certain issues may present themselves at the IT Service Desk. Let’s say a business person has posted an incorrect invoice - what should she do? The decision as to whether she should credit and re-bill the invoice or cancel it is a business decision more than it is an IT incident. It is important that a correct and consistent process is followed when business people have business queries like this. Business Process Support may be linked to Shared Services (e.g. Finance, Procurement, HR) and could mean providing advice to outsourced partners. The Application & Solution Architecture group maintain application roadmaps and standards that drive your changes and releases to your SAP solution. 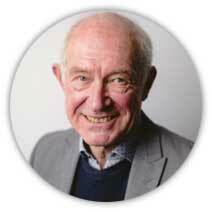 They ensure that proposed changes do not diverge from an agreed business and technical design strategy. This capability also provides assurance on high level functional and technical design specifications to the SAP Development & Configuration group so that it may be planned and managed in line with release plans. This capability provides the glue between the people in the business and the technical solution that runs the business. Where possible the solution should adopt standard SAP functionality to reduce costly customisation. Our SAP Success Report revealed that Failure to Standardise resulted in by-far the largest negative impact on SAP customers’ ability to deliver on-budget. In order to drive solution standardisation, the Architecture capability must have a deep understanding of SAP, its functionality and key design principles. Most importantly, an awareness of the art-of-the-possible with SAP enables your business to capitalise on available functionality that you have already purchased. Knowing when to customise and build bespoke solutions is a crucial function of the Architecture capability. If you simply adopt best practice, you have no competitive differentiator. Linking your business strategy with key technical innovations that drive value is crucial to your survival and growth. Think about retaining architectural knowledge as part of your core team and augmenting with subject matter experts when necessary. But don’t throw the baby out with the bathwater and ask your Systems Integrator to be both Architect and delivery partner. This should be the last IT capability you outsource. This capability is responsible for the management and control of concurrent changes through the SAP landscapes; ensuring that all object dependencies and clashes are managed, ensuring that all changes are tested, documented and approved prior to release. This team manages the integrity of the path to production, maintains consolidated release plans for production (fix) and project (evolution) environments. Release Management in SAP can get very complex very quickly. The management of SAP Transports across parallel development environments requires planning, attention to detail and invariably additional tooling. Shifting to a more Agile delivery model stresses this further, making this one of the most critical capabilities in your SAP Centre of Excellence. Everything above requires management and coordination. Strong project and Programme Management disciplines need to exist even when a large programme of activity is not underway. This means that your SAP Centre of Excellence must retain sufficient project management resources to maintain strong and consistent programme management principles. Some of your project management resources will be supplied by partners and Systems Integrators. But don’t forget that most of the things that make your SAP project a success are your responsibility. You’ll require strong business project management to gain agreement, alignment and drive the necessary stakeholder input if your SAP investment is to pay off. Your SAP environments will comprise Dev, Test and Production for each system in your landscape. In addition, you may have other systems such as Pre-Prod and Training. These technical environments need to be carefully orchestrated to support development and testing activity. This includes creation of clients, system copies and migration of transport requests. It is crucial that the right ‘build’ is representative throughout the development cycle. This requires that the transports are correctly sequenced and that the changes made across parallel development environments are correctly retro-fitted by your Build & Release Management capability. Environment Management can make or break an SAP project. Think carefully about the technical skills required (which may be outsourced) and the management skills required (which may perhaps be retained). When changes need to be made to your SAP solution, they will typically be Development or Configuration changes. Both need to be migrated from your Dev to Test to Production environments via SAP’s Transport & Correction system. The Development & Configuration capability within your SAP Centre of Excellence is responsible for the design and development of changes to your SAP systems including maintenance, fixes and enhancements. In addition, they will undertake the delivery of larger projects, bespoke developments, contribute to testing, training and cutover. Many SAP Centres of Excellence combine or rotate people in their Functional Delivery and Development & Configuration capabilities. It’s a topic of much debate and there are pros, cons and many factors which may affect your decision on how to structure these teams. Whichever way you decide to go - in-house, outsourced, hybrid - or whether you opt for a single team or split Projects and Run into distinct groups, you’ll find that this group has to be the most flexible, fungible and capable if you are to be successful with SAP. The testing capability within your SAP Centre of Excellence needs to provide testing services to ensure application and technical changes are fully tested prior to release. This includes unit, system, user acceptance, regression, and stress and load testing. Test scripts and scenarios must be maintained and you will require tools to both manage the testing process and potentially automate test execution. You will also need to plan to manage test environments with realistic test data (production copy data is best) and where possible test using realistic user security profiles. SAP is essentially a big box of business processes. It’s not an IT solution, it’s a business application. So, the people responsible for the success of SAP are not IT people, they’re business people. The people best placed to make SAP a success are appointed representatives responsible for the operational effectiveness of business processes. Business Process Owners may be operational business managers or nominated process experts. They may represent a single region or business unit, or they may take global responsibility. In large organisations, there may be a more complex matrix structure. But it is essential to your SAP success that a Business Process Ownership structure is established to drive change, adoption and performance across each business process. If your Business Process Owners are to influence the performance of business processes in a measurable way that supports your business case or transformation agenda, there needs to be a specific focus on initiatives that drive business improvement. Change Management is often cited as an important part of SAP programmes and bad change management usually carries at least part of the blame for failed SAP programmes. But change management is not a transient activity - people do not change just because a new IT system has been implemented. Change takes time, patience and a concerted effort. Supported by Training, Education and Communications, your SAP Centre of Excellence’s focus on Business Improvement & Change can drive ongoing initiatives that shift the needle on key business case KPIs, process metrics and make subtle changes to business processes (which may not always require technical change). If the focus of Training, Education and Communication is Adoption, the focus of Business Improvement & Change is Performance. Every change to your SAP solution (and business processes) is a requirement. 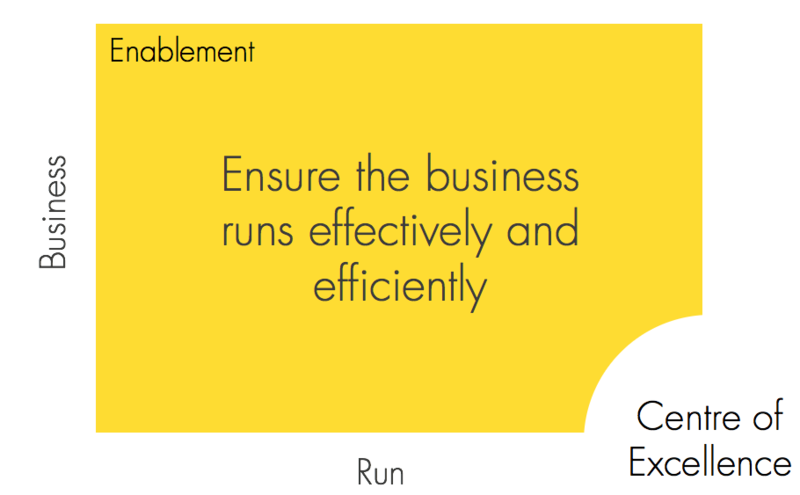 But most SAP customers don’t do a great job of capturing and articulating requirements clearly. If you have an ambition to reduce your SAP release cycles and move to more frequent, more Agile releases, your Requirements Management capability needs to be very, very good. Clearer requirements lead to greater certainty. And clearer requirements lead to an ability to perform fit-gap analysis with standard SAP functionality, which in turn leads to a more standardised, lower cost SAP solution. New requirements should be linked to process improvement initiatives and benefits so that your SAP roadmap can be built to support your business strategy. Too many SAP customers base their direction on the SAP product roadmap rather than charting their own course. Most Business Cases for large SAP programmes go missing. Once the capital expenditure is secured, the business case mysteriously vanishes into a drawer or is left to gather dust on a shelf. Great SAP Centres of Excellence ensure that the business case and the benefits within it remain visible. This in turn sets the context for the team and guides decision making. If you create a specific capability that identifies, tracks and measures the business benefits that support your business strategy, your chances of SAP success improve dramatically. The data in your ERP solution is like the blood in your veins. It’s constantly pumping through your business processes to keep them alive. But bad data doesn’t just disrupt your business processes, it infects your management information, reporting and analytics. And, if you have ambitions to apply Robotic Process Automation, Machine Learning and Artificial Intelligence, you need an immaculate data mentality. Your SAP Centre of Excellence needs a capability that provides strategic management and control of your business data to ensure high levels of process rigour and accuracy of business analytics and insight. Mature SAP Centres of Excellence implement Data Stewardship practices - making individuals responsible for SAP data quality in terms of accuracy, accessibility, consistency, completeness and, of course, maintenance. Adopting ongoing data cleansing in production is another trait of high performing SAP Centres of Excellence. Treat your data as a precious asset and manage it accordingly. Yes. It’s a buzzword. 3 Years ago, we'd have called this ERP Strategy. Sure, it’s more of a deliverable than a capability. But if you unpack Digital Strategy down to a more meaningful level, this is the thing that describes your business strategy in a way that can be converted to a technology roadmap. Where do you want to be and how can technology enable your journey? Your digital strategy starts with your business strategy, your vision and your value chain. It doesn’t start with vendor solutions or consultancy sales pitches. Your SAP Centre of Excellence needs to find space to conduct a strategic analysis of your business and the wider corporate ecosystem to identify tactics that underpin your competitive advantage (or survival). 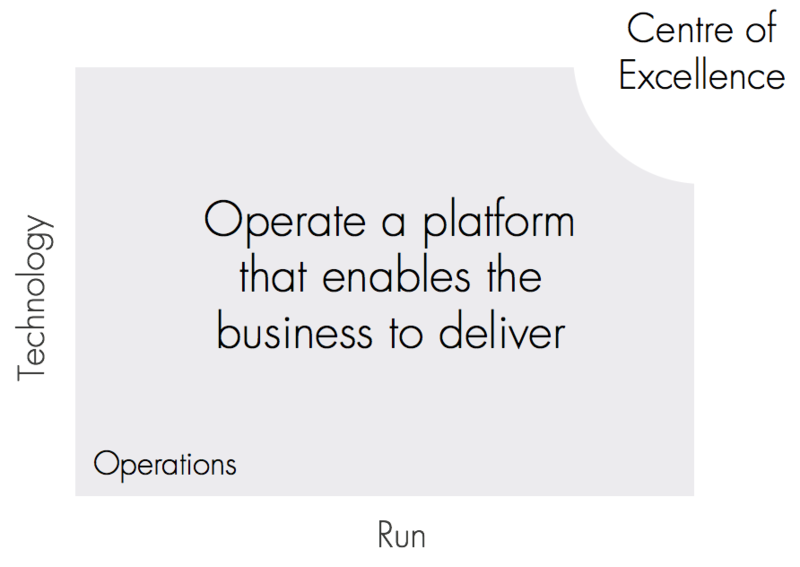 Then define an over-arching applications roadmap that delivers. When there’s a lot to do, things get confusing quickly. Having visibility of all of your projects, programmes and initiatives in a central place massively increases your chances of being successful. Your portfolio should comprise both technology and business initiatives. It should break each element down into phases that clearly demonstrate synergies and contention. Your SAP Centre of Excellence needs to link in with other concurrent projects and programs to meet strategic and tactical objectives. The PMO provides the heartbeat of the SAP Centre of Excellence and integrates all 4 quadrants to drive SAP Success. A strong, active PMO provide, planning and control, RAID (or RAAIDD) management, status reporting, people & resource orchestration, scope and change control, deliverables coordination, supplier management, tools and standards, and it supports financial and benefits tracking. These Project and Programme Management disciplines need to exist even when a large programme of activity is not underway. And your PMO ensures that the other 26 capabilities in your SAP Centre of Excellence work to the same standard whether they’re in the business or IT and whether they’re in-house or outsourced. Talk to one of our experts and discuss practical ways to improve your SAP Centre of Excellence.